The false widow spider has become a bit of a tabloid sensation recently. 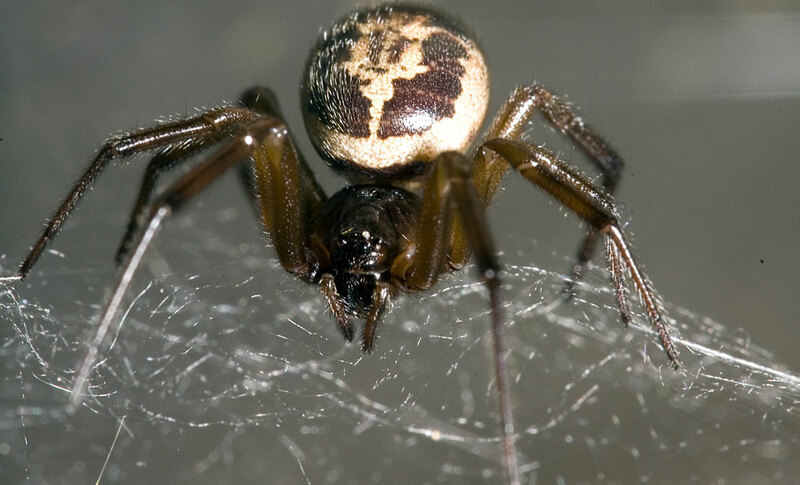 It is cited as being Britain’s most dangerous spider, the most poisonous spider in the UK and even potentially deadly. So why, with these fearsome credentials, is it that a spider known to have inhabited the UK for over 150 years was virtually unknown up until a couple of years ago? Well it seems that the false widow spider is increasing its range from the south of Britain with sightings reported as far north as Scotland. A milder climate may be responsible for this trend. With recent news stories such as a school having to close due to a false widow infestation and a grandfather ending up in intensive care after a single bite it is little wonder the spider has gained some notoriety. The name false widow spider refers to spiders of the family Steatoda, usually Steatoda nobilis, the noble false widow. It comes from the fact that the false widow bears a resemblance to the black widow spider, renowned as one of the world’s deadliest spiders. The spiders are actually related, both coming from the Latrodectinae sub-family, however, the true widow spiders have much more medically significant venom. Widow spiders get there name from the habit the female black widow spider has of sometimes eating the male spider after mating. Whilst they have been known to be imported into the UK with cargo they have never become established owing to the damp climate. It has been reported that in the wild the false widow spider has been known to prey on the black widow spider. Whilst it is the noble false widow spider that is generally referred to there are several other species of false widow spider (Steatoda) that can also be found in the British Isles. Most common of these is Steatoda grossa, the cupboard spider. There are six species of false widow spiders (Steatoda) that are now considered native to Britain. Four of these are true natives and have been here for many hundreds of years. The others are relatively recent introductions that have gained a foothold in the UK ecosystem. The most common of these are S. bipunctata, S. grossa and S. nobilis. S. bipunctata (rabbit hutch spider) is not known to bite and is extremely common throughout Britain. S. grossa (cupboard spider) is resembles the black widow spiders more than the others and also packs a painful bite. This spider has long been considered native to the UK and until recently attracted very little attention. The false widow spider that has received most of the attention is S. nobilis, the noble false widow. It is probably due to its slightly larger size and the fact that it prefers a warmer indoor environment making it more likely to come into contact with humans. It is believed that this spider arrived in Britain in 1879 on a crate of bananas carried from the Canary Islands. It is only since the 1980s that the spider appears to have spread beyond Devon with sightings all along the south coast of England. More recently S. nobilis has been recorded as far north as the Scottish border. What to do i have these in my house do i just leave them alone. Because i have been catching them and throwing them outside. Problem is they like it inside so they’ll probably just come straight back in. If you don’t want to kill them make sure you put them a fair distance from your house.